Performing full mower maintenance once per cutting season is important to keep your mower in top running shape. This article is the fourth in a series of maintenance articles that cover complete mower care. While this post is focused on replacing the spark plug in a push-type lawnmower, the basic principles can be applied to all 4-cycle gas powered equipment (including such things as a pressure washer or chipper shredder, and even an automobile). For the entire series, we’re performing maintenance on both a Craftsman 6.5 horsepower self-propelled mower, and a 4.5 horsepower Murray mower. Both push mowers are powered by Briggs & Stratton small engines. One of the top reasons a lawnmower won’t start is a faulty or worn out spark plug. The spark plug ignites the repeated explosions inside the cylinder of a lawn mower’s engine. 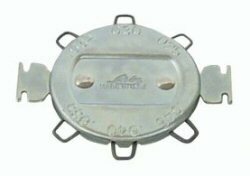 Since it sits inside the cylinder, it is subject to very high heat, corrosion, and wear. When a spark plug detoriates too much, it loses its ability to generate a full spark, and two things can result: (1) the spark plug cannot produce sufficient spark to ignite the fuel in the chamber, and the lawnmower won’t turn over at all, or (2) the spark plug produces a sub-optimal spark, and the explosion inside the chamber is uneven. The second can result in an engine that rattles or vibrates, and occasionally stalls. Step 1: Locate the spark plug on the engine. 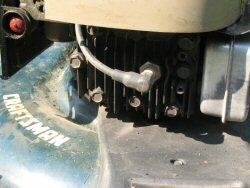 On a lawnmower engine, the plug location is usually obvious, as the wire that provides the electricty for the spark connects to the end. 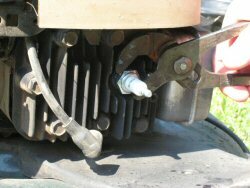 On both our Briggs and Stratton engines, the plug is located in roughly the same spot. Step 2: Remove the spark plug wire and unscrew the plug from the engine. The tool required to unscrew the plug depends on the plug’s location. If the plug is embedded deep inside a hole, you may need to use a spark plug socket to grip and remove it. This special socket has a deep well and a hard foam insert that grips the plug during installation and removal. If you’re planning to do car tune ups in the future, this type of socket is essential. You can find them at most major hardware & auto parts stores. If the plug is in an easy-to-access location as it is on both of our mowers, a pair of channel locks will work great. Step 3: Determine whether the plug needs to be replaced [optional]. We recommend replacing the spark plug every year because it is so simple and inexpensive; however, depending on your lawnmower use this may not be necessary. If the metal hook that sits over the pin looks solid and uncorroded, you may not need to replace the plug. Step 4: Purchase a compatible spark plug at the local hardware store. Most hardware stores have part look up systems to identify the right spark plug for your mower/engine. Note that even the same manufacturer will occasionally change the designations on plugs, and sometimes multiple plugs will work with the same engine, even if the plugs don’t look 100% identical. Step 5: Gap the spark plug if necessary. Gapping a spark plug means ensuring that the exact right gap exists between the sparking pin and the L-shaped bracket that covers the pin. Many plugs now come “pre-gapped” and don’t require the user to gap the plug. If your plug does require gapping, all you need is a simple spark plug gap tool (shown on the right). The tool sounds fancy, but it isn’t. It’s a simple tool that has different width metal wires. Insert the correct wire in between the pin and the L-bracket on the plug and bend the L-bracket so it fits snugly around the key. 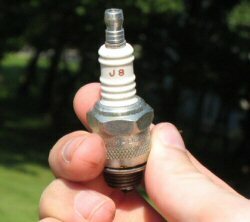 The right spark plug gap is usually listed in the engine manual for the mower. Step 6: Insert the spark plug back into the mower. Hand tighten the plug at first, ensuring there is no significant resistance. If there is significant resistance, stop immediately to avoid cross-threading. Remove the plug and begin again. Once the plug is hand-tightened, use a rachet/channel locks to tighten the spark plug in place. Do not over-tighten as this could cause the threads to strip. If you have a calibrated torque wrench on hand, you can set the torque to the exact amount suggested by the manufacturer. Step 7: Reattach the spark plug wire, start the mower, and listen. If the engine is running smooth, you’re successful! If not, recheck these steps to ensure you’ve done everything correctly. What do you think? Let us know if this post helped, or if you add/remove anything from our instructions. I am a single lady and my lawnmower hasn’t worked in some time. I was gone for a year and the people did not take care of it, left it outside sometimes and ran it dry with no oil!!! I put oil and gas in it and it still won’t start. Then I looked up the spark plug thing and I do beleive it needs a new spark plug but also, the metal interior connection on the plug wire is all rusted. How do I replace that? Thank you so much for your help!! I’ve never worked on lawnmowers but the spark plug thing is simple enough, but not how to install a new plug wire and/or clean the metal one the existing one. thanks!! Fred, Thank you! The instruction was much simpler and clearer than other sites. Now, my mower is working fine with only $2.51 of investment, a cost of spark plug. This article was GREAT! Thanks so much Fred. I also need to change the spark plug on my lawnmower and have tried to pull the “wire” off the plug to remove it and it seems caught. Do I just pull it off or does it need to turn. I know the pulg turns, but what about the piece that is holding it in place? I have a Murray Self Propeller lawn mower since 2003. About two weeks ago while mowing my yard, the machine quited working on me. I changed sparkplug, new gas, clean air filter still unable to start the lawnmower. When i pull the string, i can feel it does not a lot of compression as i was So, my feeling like it does not give me any sign of start. Is there any way i have not done or looked at before chunk it for junkyard? I have tried the plug wrench to get my old plug out but can’t loosen it. Wiil it help or hurt to spray with WD 40? And which way should I be turning it? win – probably best to use penetrating oil vs. wd-40, and it’s a typical screw, so you should be turning counter clockwise to loosen. What torque setting should be used to install a Bosch FR9DC spark plug. The engine is a 20hp Briggs and Stratton, aluminum head. Thank you SO much!! I couldn’t get my spark plug out by hand, or with pliers. I thought I’d have to take the mower in somewhere, and it’s heavy to lift. Your article informed me I needed a spark plug wrench, and of course I had one in my socket wrench set, I’d just never used it! As someone else commented, this was a great $2.75 fix (in my case), and I was on my way. Being able to replace that spark plug myself and get my lawn mowed just made my day!! I would make my day too if I could change the plug but looks like I’m not as smart as Jane and Linda. I don’t know much about tools for one but I put what was numbered as a 3/8 socket on my screw driver and it is way too loose to do any good. I’ve tried all the other 8 or 10 sockets and they are either too large, too small or just won’t turn the darn thing. Tomorrow I’ll see about getting the proper tool. My spark plug is located very close to the enginr block. It is in a tight space about 1/2- 1 inch away. Will the spark plug wrench be able to get my spark plug removed in this very tight space? Hi Mark, well I DO hate it when they make this complicated. It’s a tough call and the only way you’ll be able to tell is to try it. They SHOULD have designed it so that anything in the way of the spark plug can itself be easily removed and it would be hard to imagine a design where they wouldn’t do that (because the spark plug could be inserted after production). Sorry we can’t be of more help than that without seeing the actual situation. I have a Murray Push mower, Model 2227X50B 1240993 Maunfacture date 94158. What gap would I use when replacing the spark plug? I do not have the owners manual and Murrays site doesnt show this mower. This mower still runs like the day it was bought but I since getting it from my father I had never changed the spark plug or any other maintenance for that fact. Your page(s) have been very informative, thank you! Unfortunately, I don’t know the answer to this one, Jon. You might try calling Murray for the information, or look in a guide at your local Sears or other store, which might have it listed. The gap on the plug should be set at 0.030, although you should be able to find a plug already gapped at Sears. Would you know if a Champion EZ Start mower plug, item # 5861, is pre-gapped? Unfortunately, I don’t know that, Erica. Thanks for stopping by. Similar process. Look for the wire where the spark plug attaches and follow the same basic instructions included in this guide. Not sure, but it should be easy to see. Are there two wires coming off the engine? I have tried to change the spark plug in my Snapper riding mower, and was told to turn it counter clockwise, before trying to pull it out. I have tried that, and it is stuck, and will not turn, or come out. What do I do now? Hello, I’ve got a 2005 Murray walk behind mower model number 204212x92a that won’t start back up. It was running fine while I was cutting a portion of the lawn but all of a sudden it just stopped running. I tried to start it again but I got nothing. I’ve replaced the oil, made sure gas was in it, changed the air filter and spark plug…and it still won’t start. I noticed that the spark plug wire (the boot part) was corroded on the inside where the metal connects to the actual spark plug and I’m wondering if that has something to do with it. If so, where can I find a replacement part for it? I’ve looked online but haven’t been able to find the part. Can anyone give me direction as to where to look, what the part is called or part number? Thanks. The owner’s manual is going to be your best bet for this, Shane… You might also try to find something to deal with the corrosion. how do i change the spark plug wire on a 650series briggs & stratton lawn mower? I have replaced the spark plug and checked the air filter on my Craftsman 6.5 HP 21″ lawn mower, Model 917 388851. It still starts and runs for about five minutes before slowly dying. It sat unused for several years. Could accumulated sludge in the fuel tank be the problem? If so, how do I purge it? Is there an on-line maintenance manual for this model? I couldn’t find it. Thanks. Tired oil loses performance as it warms up. Drain and replace old oil when engine is warm. Use 4 cycle oil.